Probably the only competitive match that a Leamington team has played on an all-weather astroturf pitch - the game was played at Queens Park Rangers' Loftus Road ground during the days of its controversial "plastic pitch". The Barnet manager at the time was shy & retiring Barry Fry, now Peterborough manager - he acknowledges Terry Venables for agreeing to let the game be played at Loftus Road. The match was watched by a crowd of 1045, ending a 0-0 draw. The end of the season saw AP relegated to the Southern League Premier, where they embarked on their championship win the following season. Before this game AP had endured a miserable run, gaining only 3 points from 21 games - and included a 7-0 defeat to Bath City, and 6-1 defeats against Enfield and Scarborough. Not surprisingly they sat in last place. 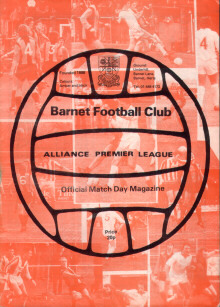 Barnet had fared little better, sitting second from bottom but with 17 points from their 21 games.